Nobody's Fools is Slade's sixth studio album, released by Polydor on 5 March 1976. Produced by Chas Chandler, it reached No. 14 in the UK and remained in the charts for four weeks. Musically, the album showed the band dropping their 'loud' and 'rocky' type songs, as they moved towards a more "American" soul/pop sound. Tasha Thomas was also hired to provide backing vocals - the first Slade album to feature female backing. British fans accused the band of "selling out" and forgetting about their fanbase in the UK, as the band had been in the States for most of 1975, trying to crack the market. The album was Slade's first (since their rise to fame) not to reach the UK Top 10, and to drop out of the chart after a chart run of only four weeks. It would be their last album to make a UK chart appearance until the 1980 compilation Slade Smashes!. Since their rise to fame in 1971, Slade had failed to achieve a major breakthrough in the United States. During the period of 1972–73, the band began touring there as a step towards trying to crack the market. A number of cities took positively to Slade, including St Louis, Philadelphia and New York City. However, in other areas, the band's anthemic, audience participation-dominated act was less enthusiastically received. By 1975, the band began feeling stale and felt they had achieved as much success in the UK and Europe as they could. Slade and their manager Chas Chandler decided that the next best career move was to try and crack America. The band agreed to relocate there in the effort to built a live reputation from scratch, much like they had done in the UK. Holder said in 1975: "During the past five years when the band peaked, we did five major tours of Britain, six tours of Europe, two tours of Australia, two of Japan, visited the USA a few times, made a film... you can understand why we felt more than a little jaded. We reckoned that we needed to undertake a fresh challenge to regain that old spark." In Spring 1975, Slade relocated to New York City and throughout the year, the band toured constantly, often second on the bill with the likes of Aerosmith, ZZ Top and Black Sabbath. While live success in certain areas of America wasn't translated into airplay, the band felt improved and rejuvenated. In between tours, Holder and Lea got down to what Holder called some "serious writing". In mid-1975, the band booked themselves into New York's Record Plant and recorded the album Nobody's Fools. Speaking in a 1976 fan club interview, Holder said of recording an album in America: "The album is why we went to the States, not for tax reasons, folks! We wanted to get fresh ideas, we felt we were getting a bit stale living in England." For the album, Holder and Lea drew much inspiration from living in New York City. The album's lead single, "In for a Penny", was released in November 1975 and reached No. 11 in the UK. The second single, "Let's Call It Quits" also peaked at No. 11 after its release in January 1976. The album was released in March and reached No. 14. 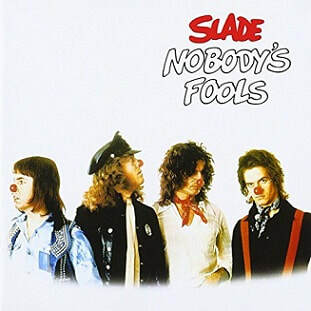 A third and final single, "Nobody's Fool", broke Slade's run of 17 consecutive hit singles in April, reaching only No. 53. In America, "Nobody's Fool" was the only single to be released from the album, however the neither the album or single made any chart impact. Reflecting on the album in an early 1986 fan club interview, Hill said: "Nobody's Fools was a bit different, wasn't it? That was recorded in America, but it didn't happen over there." The album has been noted for still standing up today as a "varied and highly entertaining listen" and the band themselves remain proud of the album. Both Don Powell and Holder rate it as their favourite Slade long player. In 1976, Holder told the fan club magazine: "We're really proud of the album. We think it's our best, but we always say that every time we bring another one out. However, there is something special about this one." Later in a 1987 interview, he said: "That is the only [Slade album] I can really sit down at home and listen to from start to finish." In a 1976 interview, Lea said: "I am really proud of the album and believe it is the best album we have ever done. I have no especial favourite track on the album - I love them all. I'm sure you will see quite an American influence on a lot of the tracks and we believe the hard work we put in, in America had paid dividends." In a 1976 fan club interview, Holder spoke of the album's recording: "We recorded the album in New York, where we spent something like six weeks on it. We did it all in one go, more or less, well we also did a couple of days in a L.A. studio a couple of months before, just to get into the swing of things." To allow the band to create what Holder described as a "really first class album", the band decided to take some time off from touring: "We decided not to rush the album, like we have done on past recording sessions. We wanted to get everything just so. It wasn't just a 'wam bam' job. We had six weeks in the studio to get better and better, so the playing got better, and the sound got better, so yeah in terms of improvement it's a big step ahead. The sound and production is the best yet." Speaking of the musical influences on the album, Holder revealed: "Ya know we've been influenced by a lotta things, particularly soul. We used some coloured chicks for back-up vocals and I really enjoyed working with them, it was something different for us, and at the same time it gave our a lot of body! Those girls have great voices. We enjoyed doing all sorts of sounds, like country, funk, rock. I mean every track has its own particular style." Lea also revealed in a 1976 fan club interview: "We just got a terrific buzz when we were working on the album. We were more relaxed than we've ever been, more willing and able to be more experimental in the studios, and we took it easy and relaxed. Certainly we felt we had a good product in the making, so it seemed right to put everything we had into it." The band decided to call title the album after "Nobody's Fool". While listening to that track one day, they came up with the idea of adding an 's' to 'Fool'. The album's cover was created to coincide with the band's 10th anniversary, showing the band adopting the same positions as they had on the cover for their 1970 album Play It Loud. Record Mirror reviewed the album and concluded: "The numbers offer a lot of variety. The most immediate thing I noticed was the arrangements - which included some solid bass work that would have done justice to Led Zeppelin. Next, there's the use of backup vocals, something Slade haven't used too much in the past. Finally, there's the pace, lots of it. It's not an album of singles - it does present tracks that are a lot deeper than I expected. You're right lads, you're nobody's fools!" New Musical Express wrote: "Well if this album is an accurate representation of their album-making ability I doubt it very much. Oh, Slade are an exciting band. Plenty of kick and grit, and their unrefined charm which has been captured from their live performances in the studio environment, but though superficially the music here is of reasonable standard, there's not a lot of depth. Really the album is just a collection of hooky little singles." Music Week wrote: "A cracking album, the group is now playing better than ever. Slade has matured to the point of being able to convert an older audience to their cause." Daily Mirror stated: "There's no mistaking the sound of Slade. Buy this if you're feeling miserable. Slade, always one of the happiest bands around, will make you feel better." John Hutson of Thanet Times wrote: "I think it is fair to say that this is a fine album and one of Slade's best. Another 11 Holder/Lea originals and, I feel, a more sophisticated Slade. It is particularly nice to hear the group getteing away from its tested formula on some tracks." He listed "Pack Up Your Troubles", "Did Ya Mama Ever Tell Ya" and "I'm a Talker" as his favourite tracks. Acton Gazette wrote: "Instead of teenyboppers, Slade must now turn their attention to the 'serious' album market - a change they will not find easy, but which they have gone part of the way to achieving with this latest album. There's still a lot of the rather worn out Slade phrases that recur throughout the tracks, and they've got to raise their songwriting beyond the simple chart stomper level and give the arrangements much more depth and variety. But don't write Slade off yet - they might just be good enough to have the last laugh." American magazine Cash Box commented: "Slade's reckless abandon approach has taken a decidedly laid back stance on Nobody's Fools. To be sure the rock is still around in abundance but, equally present, are pop subtleties and a couple of genuine mellow moments. Top listens include "All the World Is a Stage," "Pack Up Your Troubles," "Get on Up" and a raunchy rendition of "Do the Dirty"." Billboard wrote: "British quartet offers their usual lively rock with a bit more maturity than past efforts. Songs are better, production is better and singing and musicianship generally seems less haphazard in approach." The magazine listed the songs "Nobody's Fools", "Get on Up", "L.A. Jinx" and "Scratch My Back" as the album's "best cuts". Doug McMillan of Nevada State Journal (Reno, Nevada, US) wrote: "Straight-ahead rock and roll rhythms fall into elementary unimaginative guitar chords, naughty lyrics into cutsy-wutsiness, and Noddy Holder's shouting vocals into an irritating scratch before Slade's eighth LP stops spinning. They'll have to do better than this. Nobody's Fools will fool nobody." Rick McGrath of Richmond Review (Richmond, Canada) stated: "Four nice guys playing nice simple music and making bundles of bucks from all those nice young kids not interested in any of that dumb sophisticated music. The Slade sound is very straightforward, being a combination of vocals and guitar up front, with bass and drums kept simple and unobtrusive." Keith Sharp of the Calgary Herald (Calgary, Canada) wrote: "It's almost tragic that Slade are reduced to recording the rubbish which appears on its latest album. Slade's main forte is that riotous stomp and clap music which made the group so big in England four years ago. There's no way this band can get away with polished arty material, particularly with Noddy Holder's gritty voice." Geoff Ginsberg of AllMusic retrospectively reviewed the album and said: "Nobody's Fools has some really great songs on it, but all things considered it was the band's worst album at that point. Basically misguided from the get-go, Nobody's Fools is constantly trying to free itself from the oppressive production and arrangements. For the fan, this album is worth it for several of the tunes. For the uninitiated, skip this one - all in all, it's not one of their best." In 2010, Classic Rock considered the album "worth exploring" and wrote: "A surprisingly slick-sounding album, the singles "In for a Penny" and "Let's Call It Quits" are among its most immediate moments." Colin Harper of Record Collector said: "Having maintained their UK singles successes with the standalone "Thanks for the Memory" and top-drawer trailers for the album "In for a Penny" and "Let's Call It Quits" (all three imaginatively moving on from their big-chorus boot- stompers of 1972/73), Nobody's Fools, was to end their 17-song run of hits. Funk-rock album track "Do the Dirty" might have been a better choice, while "Get on Up" (similarly American-influenced, albeit exploding to better effect on 1978's Slade Alive II) proved they could rock stadiums with the best. A whiff of US prog can be detected but, largely, the old boozy Black Country humour is alive and well. It's engagingly eclectic, if not quite truly classic." As a result of their experiences in the United States, Nobody's Fools presents a different musical direction. Described as having a "California" sound by AllMusic, a genre popular at the time from bands such as The Eagles, the album explores various different genres. AllMusic said that "many of the numbers on this record are loaded with Dobros, mandos, and female background vocals." The album features a strong influence from soul music, most prominently on the songs featuring female backing vocals. Lea originally envisaged "Nobody's Fool" to be a "twenty-minute extravaganza". However, the band later agreed to cut down the song to a more standard duration as it was felt that it would not appeal to the band's fanbase. "Do The Dirty" opens with the shout of the word "boogie", which was provided by one of the band's American roadies. The band held an audition to see who could shout it the best. After "Let's Call It Quits" became a UK hit, the band had a court case taken against them by Allen Toussaint, who felt the song was similar to his "Play Something Sweet (Brickyard Blues)". The case was settled out of court with the band giving them 50% in songwriting royalties, though Lea maintained their song was one he had "never heard before or since". "Pack Up Your Troubles" is an acoustic-based country number with a "camp-fire feel". The song features Paul Prestotino on Dobro guitar. "In For a Penny" is the only Slade track to feature accordion and has the longest Dave Hill guitar solo used on a Slade single. "Get on Up" is one of the more rock-based tracks on the album. It became part of Slade's live set, with a live recording appearing on their 1978 live album Slade Alive, Vol. 2. The lyrics of "L.A. Jinx" refer to the bad luck the band seemed to suffer whenever they played in Los Angeles. Holder said in a 1976 fan club interview: "Something always goes wrong; the gear blows up, we all get electric shocks, and, oh there's always some sort of equipment fault - we're always jinxed!" "Did Ya Mama Ever Tell Ya" was described by Holder as "not exactly roots reggae, more Wolverhampton stuff!" and cited it as his favourite track from the album around the time of its release. "Scratch My Back" is another rock track in similar form to "Get on Up". "I'm a Talker" is a folk-based track. "All the World Is a Stage" features the prominent use of keyboards and closes with sound effects of high pitched laughing.